Germany-based designer Viktor Alexander Kolbig has created the Aura – a living lamp that can be controlled by lightly touching its petals and leaves! Combining nature and technology, the system uses a hidden sensor to turn on its LED light and change its color whenever the plant’s stem, leaf, flower or vase is touched. Controlled by a separate module with no electrical connection to the plant, the Aura adds a fairy-like glow to a room – hit the jump to see it in action! Kolbig created the aura as a part of his bachelors thesis at HfG Schwäbisch Gmünd in Germany. The fixture uses living plants as an interface, and it’s fashioned from a milled aluminum case and a diffused waterproof and scratch-proof cover. The base houses a programmed micro-conroller that houses and operates RGB LEDs. The simple-to-use system encourages users to interact with nature to produce different colors and atmospheres. Just want to point out that Mr.Kolbig may have "created" the Aura, but this creation has been in the market for decades. I've had my "plant lamp" since 1972.
it\\\'s possible to buy AURA ? it's wonderfull i like this plant. Germany-based designer Viktor Alexander Kolbig has created the Aura - a living lamp that can be controlled by lightly touching its petals and leaves! 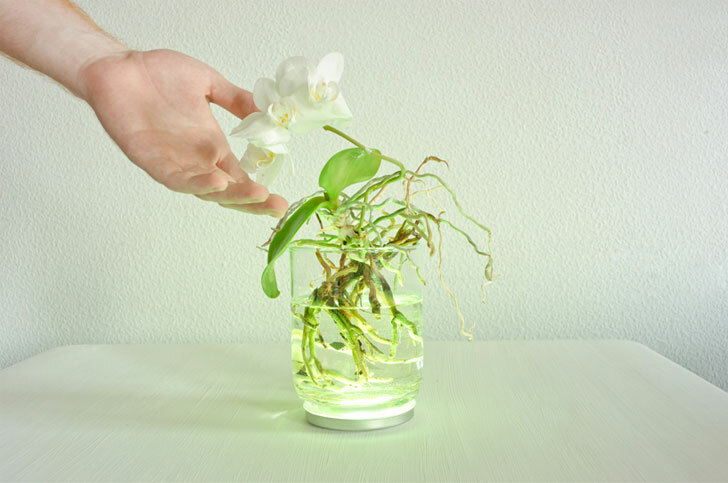 Combining nature and technology, the system uses a hidden sensor to turn on its LED light and change its color whenever the plant's stem, leaf, flower or vase is touched. Controlled by a separate module with no electrical connection to the plant, the Aura adds a fairy-like glow to a room - hit the jump to see it in action!